In one of the group’s recent studies, Gibala and his colleagues had a group of college students, who were healthy but not athletes, ride a stationary bike at a sustainable pace for between 90 and 120 minutes. Another set of students grunted through a series of short, strenuous intervals: 20 to 30 seconds of cycling at the highest intensity the riders could stand. After resting for four minutes, the students pedaled hard again for another 20 to 30 seconds, repeating the cycle four to six times (depending on how much each person could stand), “for a total of two to three minutes of very intense exercise per training session,” Gibala says. 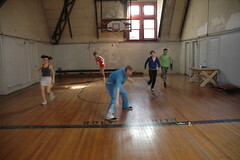 Each of the two groups exercised three times a week. After two weeks, both groups showed almost identical increases in their endurance (as measured in a stationary bicycle time trial), even though the one group had exercised for six to nine minutes per week, and the other about five hours. The Journal of Physiology article in question is located here... if you'd rather see the scientific source instead of a journalist's write-up. Also of interest is another study by the same group where the intervention lasted 6 weeks instead of 2. These studies are very interesting in their role in "paradigm shifting" the way athletes train, but, unfortunately, they're not quite as definitive in how to get people healthy through exercise. The study times are too short to observe cardiovascular adaptations and focus mainly on muscular changes that you might observe if the subjects did leg presses instead of 'sprint' interval training. In addition, Wingate tests are really really hard(or so I've heard - never done one)... and as you can see in the video, pretty much require people screaming at you to complete, even when you are very fit. Thus while I can conceive of doing this kind of training in young healthy people, it seems to me you'd really have to dial it down to get reasonable compliance... and not have to worry about people keeling over dead. Thus, from my perspective, I'd really like to see something like a 6 month study with a, still intense, but more reasonable 'sprint' workload. That said, it's very strong evidence for people, like me, who think intensity is far more important to getting fit than duration. On a personal note, it has convinced me to work more on increasing speed as a goal in my runs. I moved to intervals (run half a mile, walk a minute) shortly after I started running again, but I was more focused on getting my number of repetitions up than I was about speed. Now I intend to focus explicitly on my pace, and trying to shave time off of it. I think that will be better for me both physically and physiologically... assuming I make progress... as I continue to try and get myself into some semblance of shape.